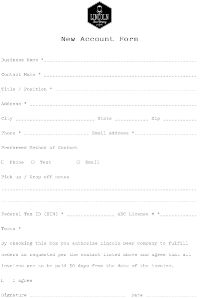 By checking this box you authorize Lincoln Beer Company to fulfill orders as requested per the contact listed above and agree that all invoices are to be paid 30 days from the date of the invoice. Thank you for submitting your new account form. We will contact you shortly with tasting/delivery options.